Thanks to community donors and our anonymous matching donor, the $200K needed in contributions has been reached! Together, we did it! 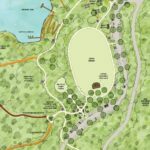 In preparing the strategy for building Valdese Lakeside Park with grant money and private donations, the first goal was to raise $200K to match the DEQ Greenway Grant – due on December 31, 2018. 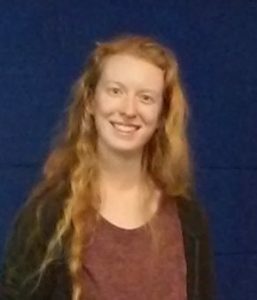 Erin Schotte with the Community Development Division of WPCOG completed the application and submitted it on behalf of the town. Erin worked on the PARTF grant the town was awarded to help purchase the park property. She knows the project well and we are lucky to have her writing the park grants. Don’t stop donating! We are still accepting donations – there are more grants to match! The more money we have, the more amenities we can build. 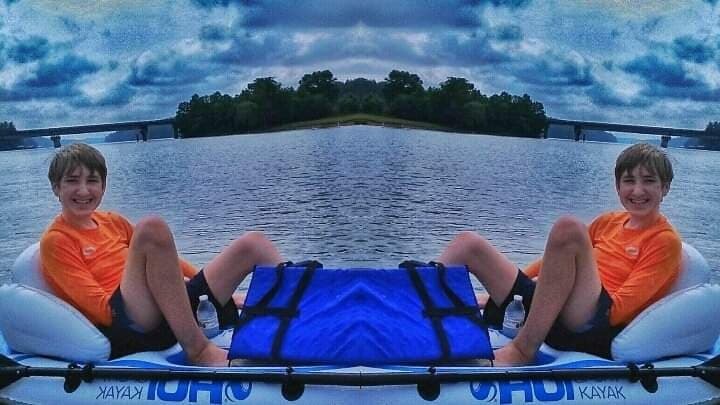 See the plans. This entry was posted in Uncategorized on January 2, 2019 by Beth Heile. There are 2 concrete corn hole stations at the Valdese Family Splash Park. However, to play corn hole, you had to bring your own bean bags – until now. 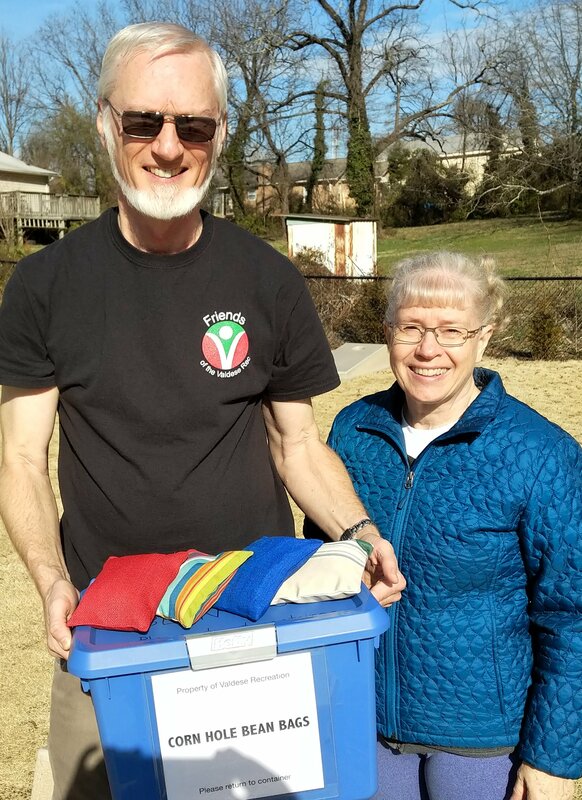 Friends of the Valdese Rec members Spence and Jayne Borden have made 16 regulation size and weight bean bags for all to use. In addition to covering the cost of materials for the bags, they purchased a storage tote to hold the bags and it will be stored in the bathroom lobby. Enjoy playing while you are there and please return bags to the tote when you are finished. This entry was posted in Uncategorized on January 1, 2019 by Beth Heile. Our inaugural 5 and 10K trail runs at Valdese Lakeside Park were a success. $1000 was raised for amenities at the park – and even though the Dollar for Dollar match challenge from a donor had expired – it was extended for the race – giving an extra $1000 to park amenities. 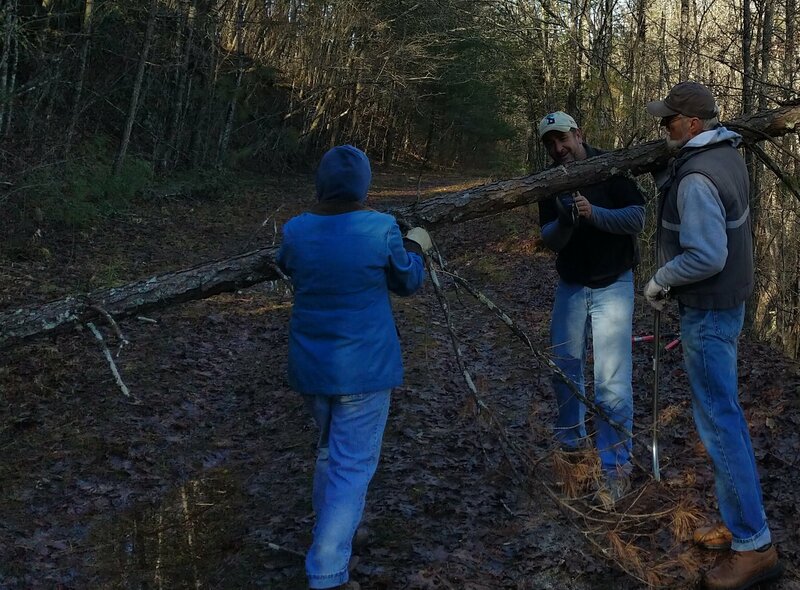 On Saturday, December 22 volunteers gathered at Valdese Lakeside Park to clear the trails after the snow storm left down trees in the way and to clean the cove. 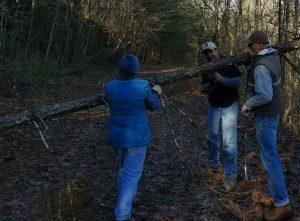 The 12 volunteers worked for 2 hours to clear about 20 trees and gather 6 bags of trash. The trails are now clear for every day use and the New Years Resolution Trail Races. This entry was posted in Uncategorized on December 22, 2018 by Beth Heile. Wicked Weed Brewery – Thanks!! 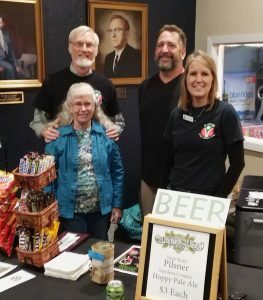 The Town of Valdese asked Friends of the Valdese Rec to serve beer at two “Concerts at the Rock” events (November 3 and November 30). To support their efforts to raise money for Valdese Lakeside Park, Wicked Weed Brewing stepped in to help. Thanks to the partnership, FVR made $464 from beers sales and tips – which will be doubled in our current Dollar for Dollar Match. In addition, FVR members sold concessions at the concerts (soda, water, snacks) and made an additional $185.01 for the FVR general fund. This entry was posted in Uncategorized on December 7, 2018 by Beth Heile. At the Valdese Town Council Meeting, Parks and Recreation Director Doug Knight presented details on the DEQ Water Resources grant the town could apply for to construct a greenway along Lake Rhodhiss and McGalliard Creek. Friends of the Valdese Rec has been fundraising for park amenities and has money available to use for the match needed for the grant. The Council voted unanimously in favor of the town applying for the grant. Councilwoman Hildebran applauded FVR on their continued efforts to raise money for the project after the problems with the fire department building halted any possible tax increase or other funding from the town for the project. This entry was posted in Uncategorized on December 3, 2018 by Beth Heile. 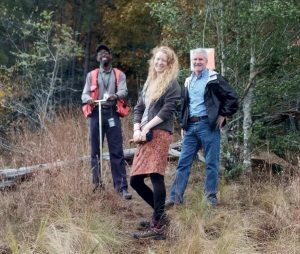 An official with the NC Department of Environmental Quality Water Resources visited Valdese Lakeside Park and McGalliard Falls Park today help us understand what is needed for a winning grant score. The $200K grant being applied for by Erin Schotte (WPCOG) on behalf of the town, will require matching funds of $200K and will be used for a greenway along the lake and creek. The official met at Town Hall with Town Manager Seth Eckard, Parks and Recreation Director Doug Knight, WPCOG Community & Economic Development Administrator Erin Schotte and FVR President Beth Heile before heading to the parks. New ideas from the day were a permeable parking area, rain gardens and making trail connections to other regions. This entry was posted in Uncategorized on November 1, 2018 by Beth Heile. 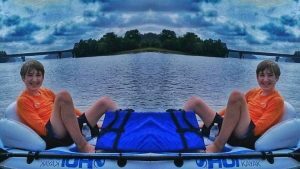 This entry was posted in Uncategorized on October 24, 2018 by Beth Heile. 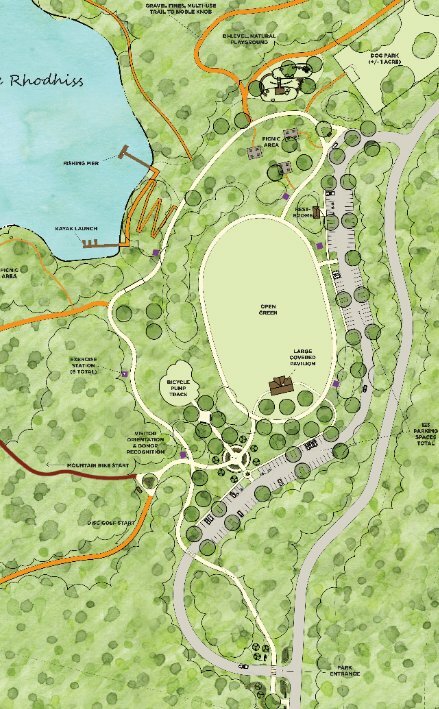 Phase 1 of Valdese Lakeside Park will be built leveraging private donations to win grants applied for by the town. This entry was posted in Uncategorized on October 20, 2018 by Beth Heile.